We left Prospect, Oregon mid-morning on September 19th on our trek toward our next stop big stop, Lassen Volcanic National Park in northern California. A couple that met on a few occasions in the Crater Lake area suggested that we swing through Lava Beds National Monument on our way south. It was well worth the diversion. Lava Beds National Monument comprises a region that was engulfed in lava flows from a nearby volcano some 500,000 years ago (I take their word for it, as I was only a child at the time). Anyway, the event left the region covered in huge jagged chunks of dark brown lava. The geologists have a name for it – I just think of it as big pieces of chocolate brownies. Another striking feature of this region is the labyrinth of underground caves (come to think of it – all caves are underground) formed by flowing lava. There are several hundred of these hollow lava tubes throughout the park presenting a wide range of exploration difficulty. 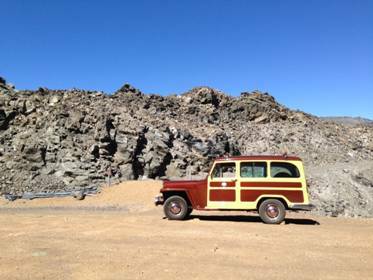 Visitors to Lava Beds National Monument are welcome to explore the caves. Equipment guidelines and flashlight are available at the Visitors Center in the Monument (I guess that a “Monument” is one step down from a “National Park”). Jean and I selected “Scull Cave” for cursory exploration. It was on our route through the National Monument and required little exertion, being close to the main road and having tall ceilings – no stooping required at the entrance. After checking out the cave we proceeded southwest through the Monument and on to Glass Mountain which had be suggested as an interesting stop by the Monument’s ranger. Glass Mountain, which sits at an elevation of 7,600 ft, is one huge, huge pile of chunks of both solid and foamed obsidian brought to the earth’s surface by volcanic action. Very impressive to see layers upon layers of continuous and fractured material. We continued on toward our night’s lodging in North Station, 14 miles north of the north entrance to Lassen Volcanic National Park; making a couple of stops. 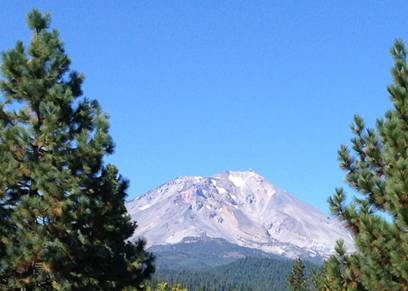 We had seen Mount Shasta peaking off to our right as we traveled generally southward. 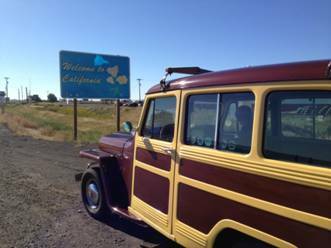 We decided to get a closer look by taking a westerly side trip to the northern California town of McCloud. From there we had a good view of the mountain from our lunch stop. Back to the trip – the last stop that we made before reaching our evening’s destination in Old Station, California was MacArthur-Burney Falls. There is an impressive waterfall just minutes from this State Park’s parking lot. The falls drop from roughly the level of the parking lot to a lagoon some 130 feet below. Perhaps the most striking feature is that some of water from above, in addition to that which is in the stream, emanates from the face of the stone cliff face on either side of the main stream, providing a veil like appearance. We walked down a paved trail to the base of the falls in its canyon to experience the deep roar and fine cool mist of the falls. Must be refreshing on a shot summer day. The Jeep has been performing very well, negotiating major changes in elevation (often to 7,000+ ft requiring with sustained full throttle runs) without a hiccup. Guess Jean, in her infinite wisdom, was right in advising me to keep my hands off of the engine as long as it was operating well. One usually gets a few signals when it is time to do general maintenance, and with less than 4,000 miles since I got it tuned in, I feel confident in heeding her advice – a while longer. Arrived safely in Old Station to rest up for our visit to Lassen Volcanic National Park (our sixth National Park in the Trek) the next morning.